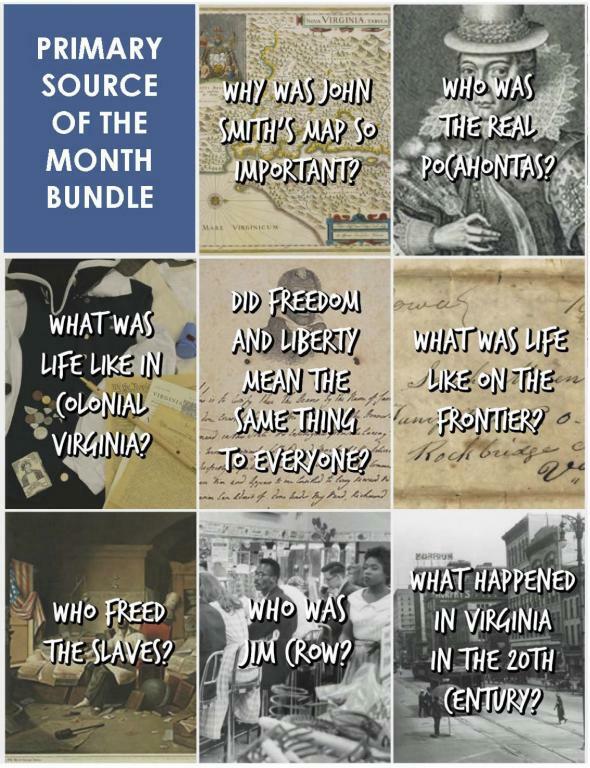 These programs will introduce your students to a different primary source each month. Through a guided inquiry process, the students will analyze and interpret the importance of the primary source and place it in historical context. The source will be aligned to both Virginia and national standards, and it will also be paired with replica artifacts to help understand its meaning. The primary source of the month program can be ordered for the entire year ($400); per semester ($200 per semester); or individually ($75 each). Each program will last one hour and will include time for question and answers with the educator. For semester or year-long subscriptions, we will arrange a standing monthly appointment (date & time). Please contact Hailey Fenner at hhouse@vahistorical.org or 804.342.9689 for booking information. October 2018 - Why was John Smith's map of Virginia so important? John Smith's map of Virginia was one of history's most influential maps, because of the importance of the Virginia settlement and the accuracy with which Smith conducted his work. Through guided historical inquiry, your students will examine different aspects of colonization while they are introduced to maps as primary sources. November 2018 - Who is the "real" Pocahontas? This program will examine some of the many depictions of Pocahontas over time, including the one depiction made in person. Students will learn how to interpret a picture as a primary source, and through historical inquiry, determine which depiction is the "real" Pocahontas. December 2018 - What was life like in colonial Virginia? From cookbooks and recipes to letters and broadsides, this program will look at a variety of different primary sources that shine a light on what life was like in colonial Virginia. We will even take a look at the bounty that the House of Burgesses placed on the head of Blackbeard! January 2019 - Did freedom and liberty mean the same thing to everyone? Discover the implications that the American Revolution had on ideas of freedom and liberty. Students will examine the relationship between enslaved African Americans and these ideals through and investigation of Dunmore's Proclamation, James Lafayette's petition, and Peter Sublett's manumission. In 1849, John Robertson Maben traveled to California in search of gold. In a series of thirteen letters, Maben describes his travels to his wife, Sarah. These letters are especially vivid as Maben was witness to events both momentous and mundane. He wrote of the cholera epidemic of 1849, the great St. Louis fire that same year, and the excitement and brutality of the California gold fields. In this program, students will join Maben on his journey, interpreting his letters, tracing his travels on a nineteenth-century map, and examining the landscape. March 2019 - Who freed the slaves? This program focuses on an examination of political cartoons and paintings that highlight Abraham Lincoln, the Emancipation Proclamation, and the end of slavery. Through guided historical inquiry, your students will examine Lincoln's role in freeing the slaves, while they are introduced to political cartoons as sources. April 2019 - Who was Jim Crow? After the Civil War, Virginians eagerly embraced economic development and technological change while resisting political and social change. Indeed, as Virginia moved forward in many ways and living standards improved, society was rigidly segregated by race. This program examines the ways in which Virginians and other former Confederates dealt with rebuilding and reunification after the Civil War. Particular attention is paid to the impacts of the 13th, 14th, and 15th amendments, the origins of Jim Crow, and other steps taken to disenfranchise African Americans and poor whites. May 2019 - What happened in Virginia in the 20th Century? Using photographs and primary sources throughout the twentieth century, this program is designed to allow students to examine changes in Virginia's society and politics. Students will explore context clues from these photographs to develop and awareness of the changes that occurred across the commonwealth during the 1900s. Historical themes such as education, industrialization, urbanization, transportation, and the changing roles of women are explored. Students will learn how World War I, the Great Depression, World War II, and the Cold War accelerated the integration of Virginia back into the national mainstream. Are you interested in learning more about our interactive video conferencing programs? I can help you schedule a program or answer any questions you may have. Feel free to contact me at hhouse@VirginiaHistory.org or 804.342.9689. Learn about our student workshops.